Courtesy of the Society for Pennsylvania Archaeology Allegheny Chapter. This triangular projectile point was recovered by the Society for Pennsylvania Archaeology Allegheny Chapter at the Hatfield site, a Monongahela village located in Washington County, Pennsylvania. 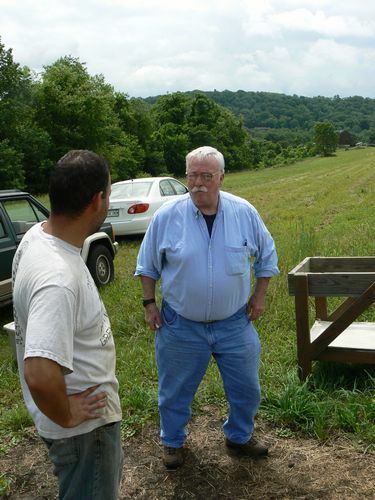 In June 2009, Jason Espino (left) discusses the excavations he is leading at the Hatfield site with noted Monongahela scholar William C. Johnson.